I just got off of the telephone after consulting with an attorney who is representing a clinical social worker named as a defendant in a lawsuit. The attorney explained that the social worker, who is employed by a mental health center, provided counseling services to an adolescent boy whose parents were in the process of divorcing. The mother alleged that her estranged husband was emotionally abusive, sought a restraining order, and filed for sole custody of the child. During the course of the counseling, the social worker met individually with each parent. At one point the mother's attorney asked the social worker to share his impressions of the father. The social worker told the attorney via e-mail that he was very concerned about the father's emotional instability and abusive tendencies. In one message the social worker told the attorney that in his professional opinion the father posed a serious risk to both his wife and child. • "When social workers provide counseling services to families, couples, or groups, social workers should seek agreement among the parties involved concerning each individual's right to confidentiality and obligation to preserve the confidentiality of information shared by others. Social workers should inform participants in family, couples, or group counseling that social workers cannot guarantee that all participants will honor such agreements" (standard 1.07[f]). • "Social workers should inform clients involved in family, couples, marital, or group counseling of the social worker's, employer's, and agency's policy concerning the social worker's disclosure of confidential information among the parties involved in the counseling" (standard 1.07[g]). 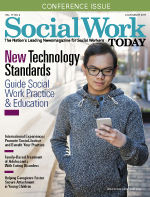 • "Social workers should be alert to and avoid conflicts of interest that interfere with the exercise of professional discretion and impartial judgment. Social workers should inform clients when a real or potential conflict of interest arises and take reasonable steps to resolve the issue in a manner that makes the clients' interests primary and protects clients' interests to the greatest extent possible. In some cases, protecting clients' interests may require termination of the professional relationship with proper referral of the client" (standard 1.06[a]). • "When social workers provide services to two or more people who have a relationship with each other (for example, couples or family members), social workers should clarify with all parties which individuals will be considered clients and the nature of social workers' professional obligations to the various individuals who are receiving services. Social workers who anticipate a conflict of interest among the individuals receiving services or who anticipate having to perform in potentially conflicting roles (for example, when a social worker is asked to testify in a child custody dispute or divorce proceedings involving clients) should clarify their role with the parties involved and take appropriate action to minimize any conflict of interest" (standard 1.06[d]). • A social worker in independent practice provided counseling to a wealthy client. The client struggled with depression and anxiety symptoms. The client Googled the social worker and discovered that the social worker had started a nonprofit foundation to provide pro bono social services to survivors of domestic violence. The social worker's foundation website provided an opportunity for supporters to donate funds. The client donated $25,000. Initially the social worker was delighted to receive the donation. Upon reflection, the social worker wondered whether she could accept the donation because of the dual relationship. • A social worker at a mental health center provided counseling to a woman coping with challenging marital issues. Professionally, the client served as attorney in charge of the local county's tax assessor's office. Coincidentally, the social worker was experiencing serious financial difficulty and owed the county a significant amount of back taxes. The social worker received a form letter with her client's computer-generated signature demanding that she contact the client, in her official capacity, to discuss the tax delinquency. • A clinical social worker's sister was embroiled in contentious divorce and child custody proceedings. Based on his extensive social contact with his brother-in-law, the social worker believed that his brother-in-law struggled with untreated bipolar disorder and, thus, posed a threat to the children. The social worker wrote a letter, on his professional letterhead, expressing his "professional opinion" about his brother-in-law's alleged mental illness and encouraged the court to grant full custody of the couple's children to his sister. The brother-in-law filed a licensing board complaint against the social worker alleging unprofessional conduct arising out of the conflict of interest. • A social worker served as an administrator of a state's social work licensing board. In his personal life, the social worker served as guardian for his elderly mother, a nursing home resident. The social worker became increasingly dissatisfied with the quality of care provided to his mother at the nursing home and was particularly critical of the nursing home's social worker. The licensing board administrator filed a complaint against the nursing home social worker. The licensing board administrator wrote notes to the board's attorney, using board letterhead, regarding the case. The nursing home social worker filed a licensing board complaint against the board administrator alleging a conflict of interest. Clearly, social workers have a duty to be alert to conflicts of interest and do what they can to avoid them. Some conflicts of interest rise to the level of impropriety or blatant wrongdoing. Examples include clinical social workers who pay colleagues for referrals or enter into intimate relationships with clients. Fortunately, very few social workers engage in such flagrant conflicts of interest. What are more common are circumstances where social workers' conduct creates an appearance of a conflict of interest. These are instances when social workers do not knowingly engage in a conflict of interest, but their behavior creates an appearance of one. For example, the social worker who used his position as a licensing board administrator to advance his personal interests with regard to his mother engaged in a conflict of interest. Similarly, the social worker who "diagnosed" his brother-in-law to be supportive of his sister engaged in a conflict of interest. In contrast, the social worker whose client was the attorney whose office oversaw the social worker's delinquent tax cases had to take steps to avoid even an appearance of a conflict of interest. In this instance, the social worker acknowledged the potential conflict of interest with her client directly and discussed whether they could continue working together. The client told the social worker that she had no direct knowledge of the social worker's tax case and wanted to continue their counseling relationship. The two agreed that they would not discuss the tax matter and that the client would recuse herself from any formal involvement. Social workers who face actual or potential conflicts of interest would do well to consult relevant standards in the NASW Code of Ethics. Furthermore, it behooves social workers to consult with thoughtful colleagues who are familiar with ethical standards in the profession and are willing to dissect complex conflict-of-interest issues. One key benefit is that ethics consultants who are not directly involved in the scenario may be more objective about the ethical challenges and possible remedies than the social worker who is personally immersed. When there are thorny legal issues—for example, when the situation might trigger an ethics complaint or lawsuit—social workers should consider obtaining legal consultation, especially from a seasoned attorney who specializes in risk management for health and behavioral health professionals. Furthermore, social workers should document the steps they take to address the conflict of interest; this can help enormously in the event anyone raises questions about the social worker's judgment. Conflicts of interest, and the appearance of conflicts, can arise in any line of work. Ethical practitioners are vigilant in their efforts to avoid them and, when they arise, manage them skillfully.